It is said that the way to really know someone is to know who their friends are. Friends play a big part in influencing and shaping your thoughts and ideas. It is also equally true that books are friends. From them you learn things on an abundance of topics and gain knowledge, inspiration, and encouragement. With such friends, you can travel the world, visit old eras, or empathize with someone quite unlike yourself - all from the comfort of your own home. Miriam and I have always been what you could call avid readers. 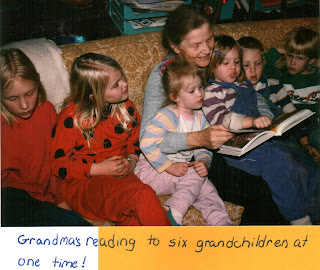 =) Before I could read, I have memories of many happy hours spent listening to a parent or older sibling read to me stories from The Little House on the Prairie series or The Chronicles of Narnia, as well as various short children's books. 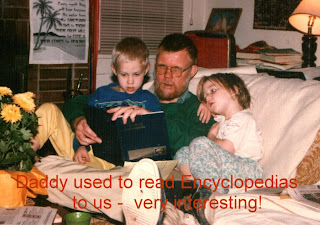 I learned to read around the same time Elijah did (Mom kind of taught us together) and from there I took off into the great and exciting world of books. When asked to tell of my interests, reading has always been near the top of the list. I don't read as much as I used to, mainly because there are so many other things that need to be done each day. However, I well remember the days when we used to go to the library nearly every week, where I'd often check out a huge stack of around 8-10 books. I voraciously devoured all I could, spending hours inside or out reading, and reading every other spare moment - in the car, during breakfast, or in each small break I had! 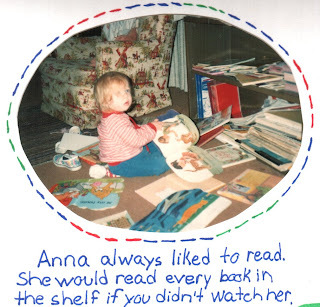 my dad often teased me about being a bookworm, and it's true that my nose was often stuck in a book! Lately, my reading is usually confined to reading during breakfast, right before bed, or infrequent spare moments. I bring a book with me almost wherever I go; if I happen to be the passenger instead of the driver, I read in the car, using the booklight my dad gave us if it's dark outside. If I get to a lesson early, I always have a pleasant way to fill those few minutes! Those of you who enjoy reading can probably relate to how a book can grab your attention and not let go until the last page is finally turned. I have to watch myself before bed, because I can often keep going for quite some time, reading just one more chapter until it gets rather late! Sometimes the books are so intriguing I can barely put it down, and will make time in the day to finish it up! There's nothing like reading to make you feel better when your sick and take your minds off of aches; the hours in the car on long trips just wouldn't slip by as quickly without a book in hand! My enjoyment of reading probably won't ever wane, though I'm sure my time available for it will diminish as I get older, once I become a mother, etc. However, I will always enjoy the things I'm able to learn from books, be it little lessons tucked into fiction, inspirational biographies, or how-to books. Which leads me to the point... Starting this month, Miriam and I will be posting our reading list for the month at the end of it or beginning of the next one. I toyed with the idea of having one list we simply linked to and updated periodically, but concluded that by posting a list each moth, it would be easier for both you and us to keep up with. We will be posting a short synopsis or review to let you know what the book was about and how we enjoyed it. Are there any other avid readers out there? We'd like to know what you've been reading! Each month you can either leave a comment telling of your favorite or latest-read books, or you could post your reading list for the month on your blog. That way we can both see what you've been up to and get ideas from each other for books we might like to read. Our January reading list will be posted in the next few days. It may not be complete, since we just came up with this idea recently, but we'll try to remember what we've read this past month! As a side note, we won't be linking the book titles to any particular place to buy them. Not only would that take a lot of work, it'd also be hard to link to just one place since books are now sold many places. If you're interested in buying a certain book, a quick Google search for the book or looking on Amazon.com, Half.com, or Ebay.com should help you find it at a reasonable price. I couldn't agree more!! I LOVE to read. Mama would often tease me because I could even be found reading a book while brushing my teeth! :) :) I simply can't get enough of books(which can be a really good thing, for you can get a great education, for instance, by just reading books)! Praying that you two are having a wonderful, peace-filled and productive week! Blessings to you, dear sisters! This is a neat idea.I love reading, but like you mentioned there are so many other things to do through-out the day that I don't have much time to read anymore. I will beging posting my booklist on my blog jodysrosepetals.blogspot.com too. Thanks for the idea! Hmm....I will be doing my reading list for certain books on my blog. However, maybe doing my "plan" for once a month would be cool too. I LOVE to read also; I can't believe people who don't! (But I know some don't) For me, it transports me to places I will never see on my own! Hello from Australia! I'm a wife and Mum, who loves to read- but yes it takes me a lot longer to get through books than I used to! I'm currently reading "Stepping Heavenward" by E.Prentiss and "Holiness" by JC Ryle. I've recently put a couple of books from my reading pile back on the shelf for another season in life. I'm reading Anne of Green Gables aloud to our girls(4&6)as well as Tales of the Restoration, which I recently found in a 2nd hand shop. God bless you girls as you continue to serve the Lord through your website and in real life. Rebekah, I had to laugh, for I've actually read while brushing my teeth a few times. 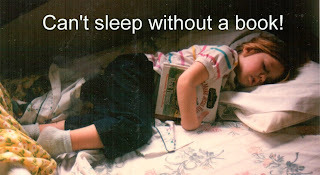 =) I agree - my dad has always said that you can get a great education by reading many varied books. I'll look forward to seeing your list! Mrs. Jody Dix: I look forward to reading your list as well! Ella: Yes, reading does transport you to places I'll never see. I know that the portrayal of countries in books is different then how they are in real life, but I've enjoyed learning about many various countries by reading books set in them. Mrs. Roberts: I've read and enjoyed Stepping Heavenward and have heard of Holiness but not gotten the chance to read it. Anne of Green Gables is a wonderful book that I've read many times! I've also read Tales of the Restoration volume 3. I love to read as well!! (when I have time, that is!) :) I often find books laying around, and just start reading them! Most recently I've been reading two books: "Recovering Biblical Manhood and Womanhood" (John Piper and Wayne Grudem) and "Millstones and Stumbling Blocks" (Bradley Heath. Both have been quite good!